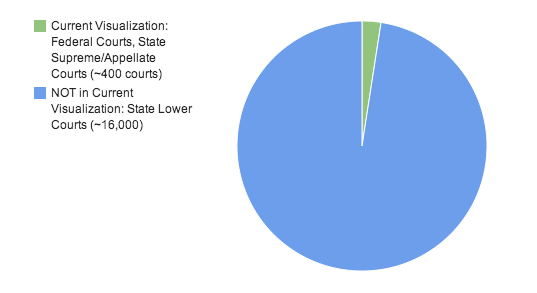 I have been on a quest to create a visualization of the entire US judicial system. There are lots of other courts within the states, of course, and diving into that is next on my list. I came across the National Center for State Courts web site that has, among other things, a count of the number of courts within the states. This includes circuit courts, district courts, municipal courts, probate courts, and even "Town and Village Justice" courts in New York. I am not sure exactly how accurate these numbers are, but it provides some perspective as to how big the total number is. includes only the courts in that little green wedge. Whatever the precise numbers are, it is clear that there's a ways to go here.